Creator: Franklin M. Davis, jr.
Quinn Leland is a contract operative for the CIA. Specializing in the Southeast Asia region, now thirty years of age, he has been in the area for more than a few years at the start of the series and is looking forward to heading home. At least part of him is because another part is hooked on the region and the life style and wonders if he shouldn’t just retire in the area. On the surface, Leland is a fairly standard American spook. He is fairly tall, good looking, physically fit, prone to drinking too much and always admiring of the ladies. Where he diverges from the norm, at least in the first book, is his larcenous ambitions. He isn't out to actually steal anything, of course, at least not in his mind. Finders keepers, really. And unlike most agents of fiction, Leland finds dealing with women far more of a problem than just love ‘em and leave ‘em. He gets entangled and harassed and befuddled and he doesn’t like it so he usually settles for another beer. The results of the first book see him fired from his job and needing another. This is why he is willing to take the offer for the crazy, dangerous assignment that comes next, one he would never have taken otherwise. In this mission, he is back to the standard spook and he is good at it. The approach taken by the series of having an agent being less than a golden boy ready to salute is quite unique considering the time period and the fact that the author was a career military man who wrote the first book as a Colonel and would go on to become a two-star general in charge of the War College. And the almost contempt that the agent has for the Agency came well before it was stylish to denigrate the CIA. 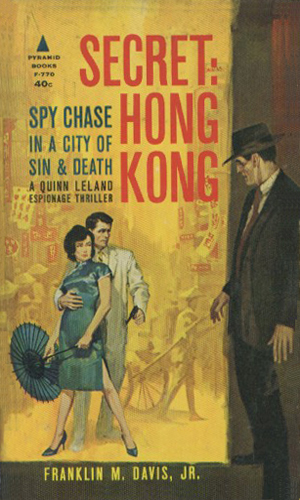 Written by Franklin M. Davis, jr.
As his contract to provide reconnaissance photos in the Southeast Asian country ends, Leland gets larcenous. His photos show where a crashed US plane with a gold shipment landed in the jungle some time back. 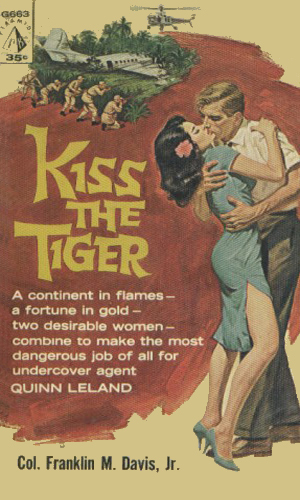 Sacked by the government and needing money, Leland accepts a contract job to help smuggle a Red Chinese scientist out of China but it has to look like a kidnapping. If Ian Fleming had made his character not quite so good and with a bit more "what's in it for me", Bond might have been like Leland. The stories have a very similar feel and the action is very much the same. Still, the kind of likeable but not totally trustworthy guy that Leland is does take some adjusting. Where the books really shine is the atmosphere. I don't know if the locales are correctly represented but the late-50s attitudes and mores definitely feel true and for that reason alone, these books are worth the time.